The information below applies to Client Service Tracker Version 9. 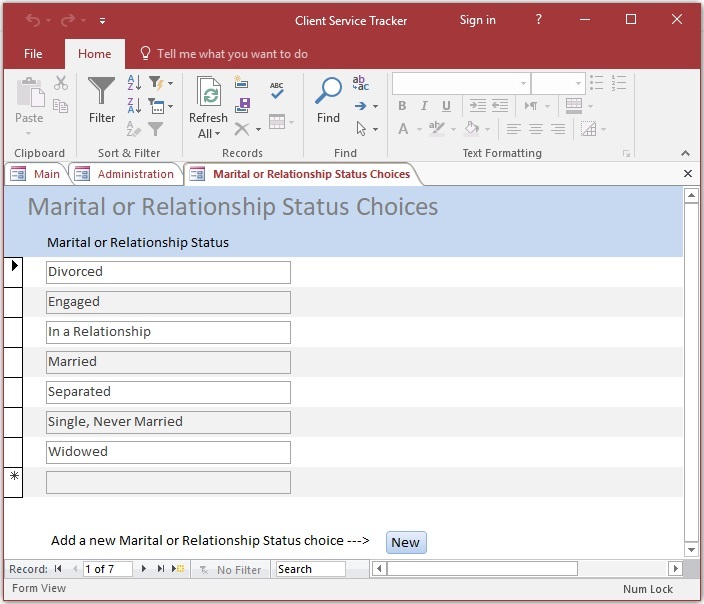 Client Service Tracker has a number of data fields that are drop-down selection lists. Shown below is one for Marital or Relationship Status. What if you want to add to the choices? Or remove a choice? You can change what is on the drop-down selection list in the Administration area of Client Service Tracker. Programs and Services are very specific to your organization, and reflect how you want to keep track of what your organization does for clients. 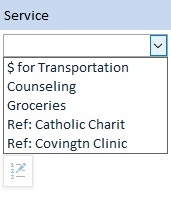 Shown below is an example of drop-down selection lists for Program and for Service. 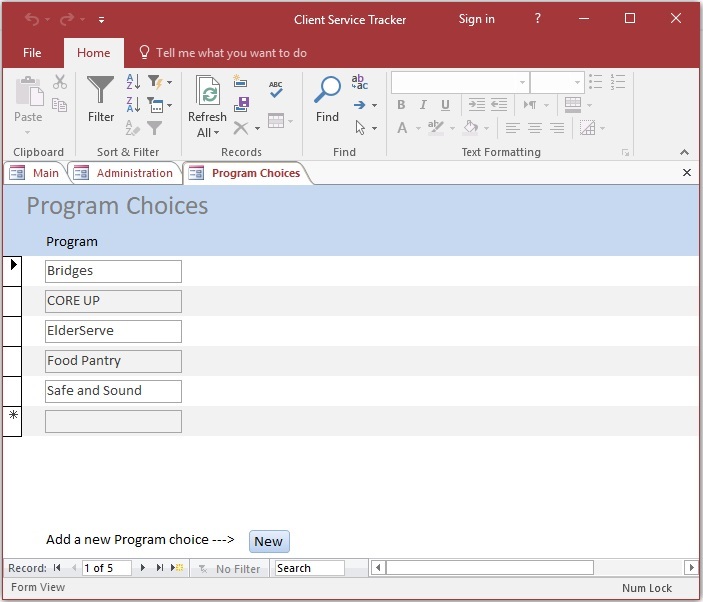 Your organization sets up the choices on these drop-down selection lists for Program and Service. In this way, you customize the software to keep track of exactly what you need to keep track of, at the level of detail you need. 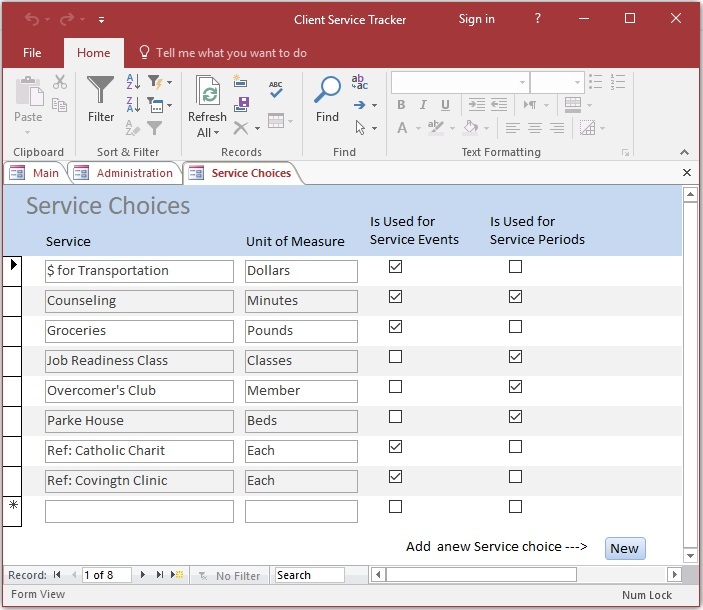 In the screen image below for Service Choices, note that you designate the Unit of Measure for each Service choice. (When you record information about a good or service you provide to a client, you indicate how many / how much of it you provided.) Note also that you designate whether a Service choice can be used for Service Events (a good or service that is provided on a specific date) and/or used for Service Periods (a good or service that is provided over a period of time). Do you want to add a data field that Client Service Tracker does not have? Get Version 9, Full and Modifiable. 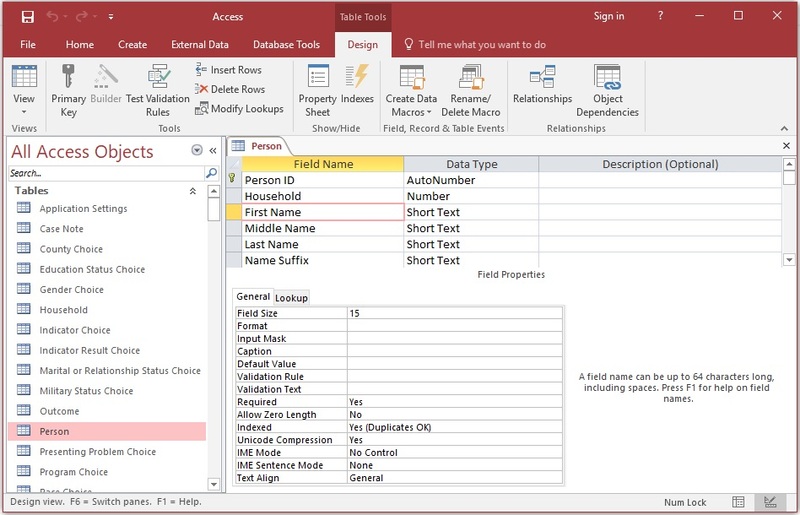 With this version, any Microsoft Access expert can add new fields, remove fields you don’t want, add custom reports, and do anything else that is possible in Access. The Microsoft Access expert can be a volunteer or employee of your organization, or a local person who works for you on a contract basis. Social Work Software will also do modifications for a fee. Send email to info@socialworksoftware.com if you are interested. Shown below is Client Service Tracker in “design view” or “database view,” where an expert can make modifications.